Cream toast, which my wife learned to make in the Midwest U.S., for breakfast today. Toast and a sweet cream gravy in which to dip it. Butter, flour, milk, sugar, and vanilla. I'm sure people have been eating variants of this for hundreds of years. I had a taste treat a month or so back - chocolate gravy! Slathered on a biscuit - it was amazing!! 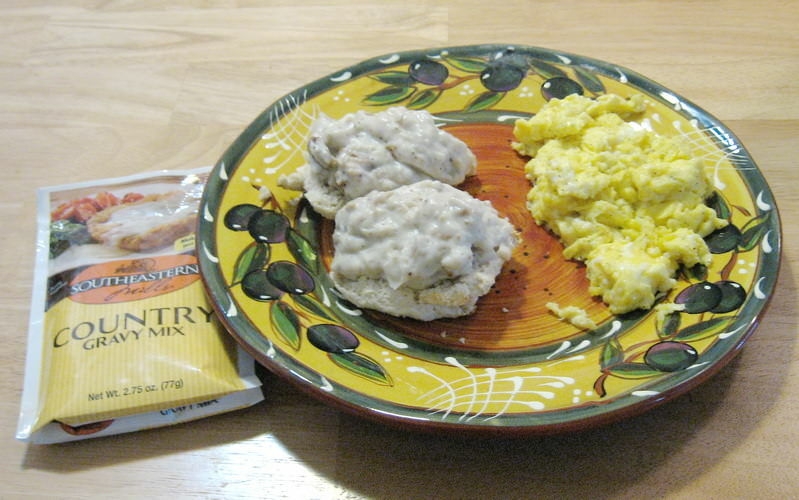 This morning we had scrambled eggs and Bisquick biscuits with Southeastern Mills Country Gravy and added sausage. Very little cooking from scratch in this household. My kind of breakfast, John. I believe your 'sweet gravy' is known in the UK as 'instant custard'. All I ever knew for custard when young, it came from the Birds Co in a tub and required mixing with milk and careful slow warming. I was fascinated with it as the cornflour in it made it non-Newtonian as you stirred; runny if poured, but stiffened up as soon as you stirred. Proto-oobleck. These days it is even more instant - just as boiling water and mix (available in the UK but not in Canada). Anyway, the ingredients are the same and the sweet thick goo resulting is the same. Never occurred to me that anyone would dip toast in it, but now I think about it (and I am getting there, albeit slowly) that ambrosial dish called bread and butter pudding is much the same, with the lower levels sodden with soaked up egg custard, and the top delicately crispy if cooked just so. When I first made B&BP I cheated and used instant custard, but the results are better with a true egg custard cooked in situ between and inside the bread, raisins, sugar cinammon, nutmeg and rum. Do not confuse this with industrial strength bread pudding, which is hard slabs of curdled stodge. Stick to the true bread and butter pudding for the distilled essence of English nursery food as still preferred by ex-imperialists everywhere. Carry on. Love a good bread and butter pudding and an old fashion sherry trifle. My wife's family used to have something called bread pudding, and it was a popular treat when they got together for dinners. She still makes it on occasion. It doesn't sound very similar to the one you're discussing, other than the name. But then again, I confess I don't know what she puts in it. Could be identical --- who knows! I believe the recipe was brought in from either Arkansas or Iowa. 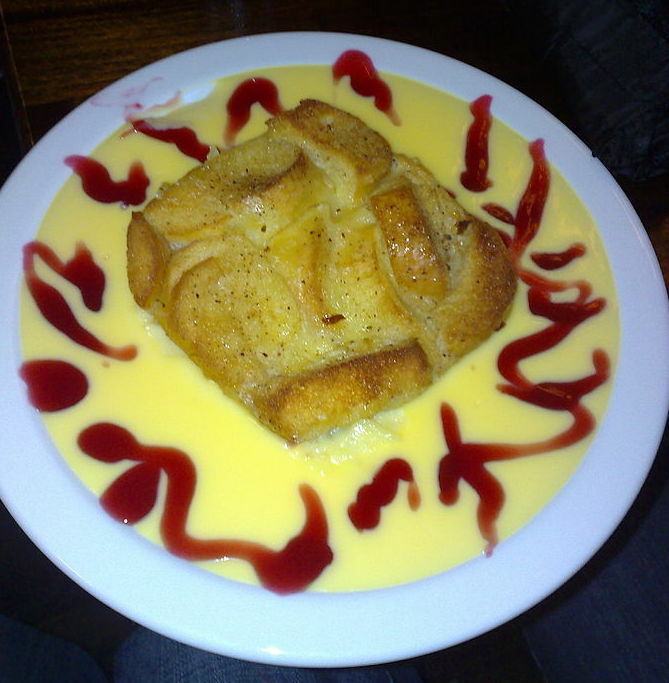 As they point out, a dry form of bread pudding is the Nelson Slice, a concoction still served as a dessert with the ubiquitous lumpy custard at school dinners in the early seventies. Dry, crumbly and dusted with caster sugar, tasted of mixed spice (I doubt any cuisine in the world other than British mixed all the desired spices - probably cinnamon, nutmeg and allspice - together and sold them commercially). 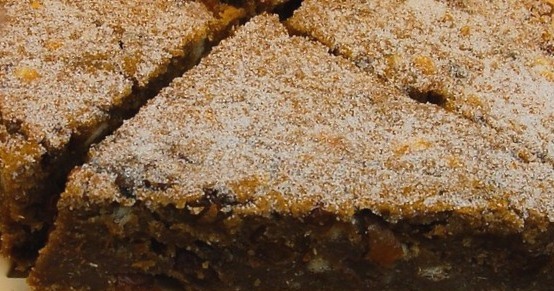 In contrast to the dryness of the Nelson slice, a bread pudding was known in some areas as a 'wet nellie'. How enticing! Some people made their Nelson slice rather wet and encased it in pastry, but I have never seen such an abomination in the flesh. On the subject of custard, I'm always slightly surprised by the lack of love it gets shown in the usa. American kids are deprived! At boarding school there’d be a jug of custard on each dining table at dinner time. One could only guess when it was made, but by the thickness of the skin on the top it wasn’t fresh. I don’t mind custard,but I wouldn’t go out of my way to get it. My wife has a tin of Birds Custard Powder on hand at all times.